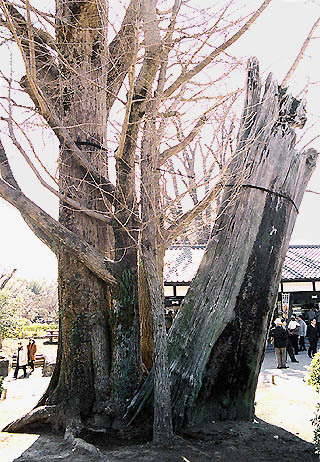 Ginkgo biloba, male, planted by General Kato Kiyomasa in 1600 at the then built castle. later a lateral shoot grew out of the basal trunk (now 20 m). 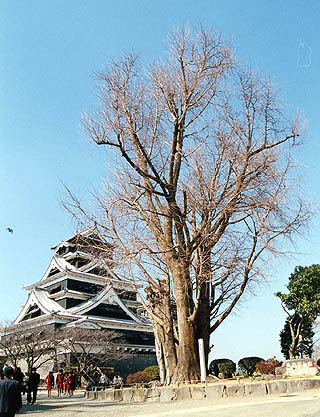 The castle is also called 'Ginnan Castle' because of the Ginkgo tree. In late fall many people come to see the place to enjoy the beautiful contrast between the yellow of the Ginkgo leaves and the black and white of the castle.